This product was conceived as our subtle way to show our support for the people and businesses of Arizona. 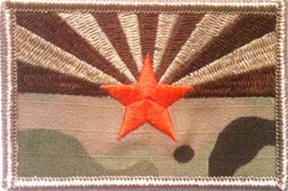 We will be including one of these Multicam® Arizona Flags with every item of GG&G Weapon Hardware inventory that our customers purchase, no limit. While Supplies Last. Measures: 2in. x 3in. (standard shoulder / hat flag size).